Emergency Lightings’ basic principle is that when the power to a localised Lighting Circuit is lost, a Local Emergency Light reacts to the loss of power and will then illuminate using a Battery Back-up power source. This is to illuminate a safe passage as to leave the premises. Regulations state that the Battery needs to power the Fitting for a suitable period of time as recommended in BS5266 when the local Power fails. Previously to aid in maintaining the required time, the light output from Fittings was decreased. However, due to the recent adaption of LED Emergency Lighting, the Light output can maintain at a higher level than before. Regulations require that a “responsible person in charge of Non-Domestic Premises, including the common areas of a House in multiple occupancy (HMO), is also responsible for the safety of everyone in the Building, whether they are guests, workers, visitors or residents’. This System will illuminate the Evacuation Routes in the event of a fire or emergency situation. Accompanied with signage, the public will have a clear and illuminated path to exit the building in a safe manor. In a place of work which houses Machines, Systems and working methods which require monitoring. When the power is lost, these places still require illumination to safely operate and shut down, adhering to the safety procedures. These Systems are installed to minimise panic when the power to the conventional Lighting System is lost. It allows occupants of the area to find their way around and illuminated Escape Route. These are Fittings which aren’t immediately recognizable as an Emergency Light. Most Manufacturers offer an Emergency version of a standard Fitting, however, upon power failure, it switches to a Battery back-up version to provide illumination as an Emergency Light. These are stand-alone designated Emergency Lights which are charged by the Mains . Thus, when power fails, the battery will operate and illuminate the Non-Maintained Fittings, usually sited along Exit Paths. Sustained Systems have a separate Lamp within a Maintained Fitting which will illuminate upon power failure. The benefit of these Lights is to reduce the chance of Lamp failure when the power fails, as these Lamps are only used during ‘Emergency’ situations. Depending on the type of System installed, routine tests can often be carried out by Staff Members on Site via a key-switch located close to the local Light Switches. This requires a special key provided by the Manufacturers so generally it is not a viable option. The usual testing procedure we have in placed is to have a monthly Functional Test (which can be carried out by your own Staff) to ensure that each Light will illuminate and does not immediately fail. Then, annually a full Test is run to ensure that the Lights can stay illuminated for the necessary time as in BS5266, providing the Batteries can hold their charge and are still functionally recharging. If a Light fails, we can take the details of the Fitting and replace the Battery. Once all the Lights are proved functional, we can then issue an Emergency Lighting Certificate. What can CW Electrical offer for your Emergency Lighting needs? 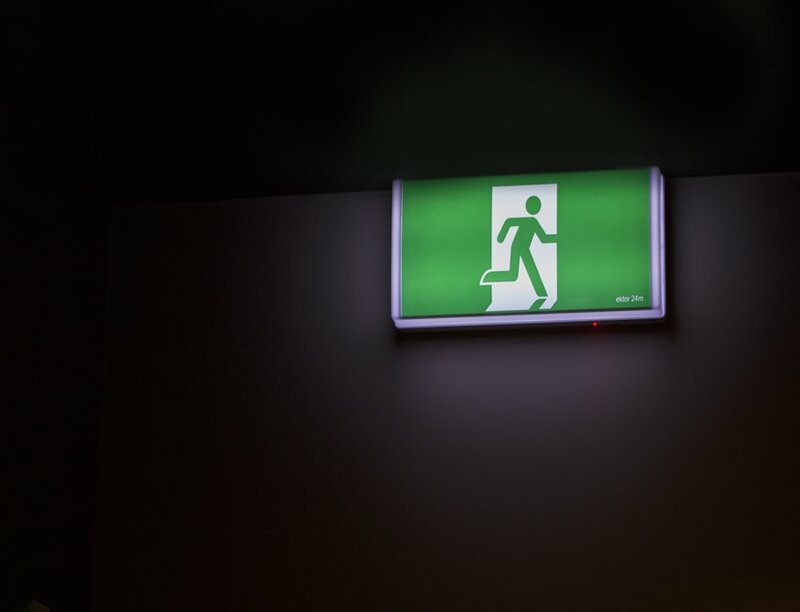 We have extensive experience in installing and managing Emergency Lighting Systems in Bristol and surrounding areas- ranging from exits in houses of multiple occupation (HMO’s), to the installation, management, and maintenance of 400+ Light Systems. For larger Premises, we can produce drawings and databases to correlate to the number of Lights throughout a Building with Battery type, Maintained/Non-Maintained, test date etc, to ensure the Testing and Maintenance of your Lights can be as cost effective as possible. Please give us a call if we can help with your Bristol Emergency Lighting needs.